The International Fund for Agricultural Development (IFAD) aims to eradicate poverty and hunger in rural areas of developing countries by investing in small-scale agriculture and connecting smallholder farmers and their communities to markets. Most agricultural practices promoted by IFAD are designed to help farmers increase productivity and income, but what impact do they have on climate change? It depends on the agricultural practice. Click here to read the publication. 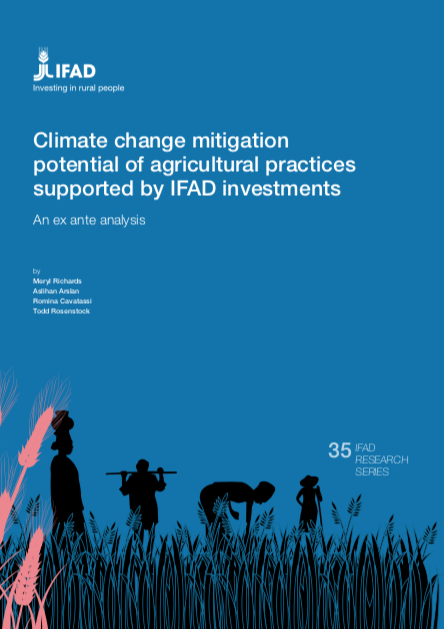 In an ex-ante analysis of activities in IFAD’s 2011-2014 portfolio using the Climate-Smart Agriculture Compendium, scientists found that the following practices contribute to climate change mitigation: promoting agroforestry, use of organic fertilizers and green manures, periodic drainage of rice paddies and pasture management. Synthetic fertilizers also have mitigation potential through soil carbon sequestration, though they increase nitrous oxide emissions (see Figure 6 in the report, also shown at the top of this page). Agricultural practices with mitigation co-benefits represent a significant commitment by IFAD. IFAD spent about $2 billion on projects that included these practices from 2011-2014, and another $1.6 billion on water harvesting and irrigation investments, with more than 1 million smallholder farmers targeted. As shown in the figure, the combined mitigation potential of agricultural practices in the IFAD 2011-2014 portfolio was 0.7 – 1.7 million tons of carbon dioxide equivalents per year (the lower and upper bounds reflect the 95% confidence intervals). This is the equivalent to the mitigation of emissions of 1.6 – 3.9 million barrels of oil consumed, or removing 158,000 – 372,500 passenger vehicles from the road for one year. The majority of mitigation potential comes from the contribution of agroforestry and organic fertilizers to soil organic carbon (SOC) and biomass carbon sequestration. While minimum and no-tillage have comparatively small mitigation potential on a per-hectare basis, the total potential impact of the practices is high because the practice is widely promoted. The authors note that the final impact on SOC could not be estimated without knowing whether concurrent increases in organic matter inputs, such as from residue retention or cover crops, were realized. On the contrary, reduced irrigation of rice, for example through alternate wetting and drying (AWD), saves water and has high per-hectare mitigation potential, similar to organic fertilizers and agroforestry, although IFAD’s portfolio contained relatively few projects that were designed to promote water-saving irrigation techniques. Meryl Richards, lead author of the study and scientist, CGIAR Research Program on Climate Change, Agri​culture and Food Security (CCAFS) and University of Vermo​nt. The mitigation potential of livestock-related interventions was not analyzed due to lack of data. In other studies, productivity-enhancing practices tend to decrease emissions per unit of meat or milk (emission intensity) but increase emissions per animal, so IFAD’s agricultural development interventions are unlikely to reduce net emissions unless herd sizes are also reduced. The mitigation potential resulting from investments in biogas and alternative energy sources will be assessed between the current and next IFAD cycles. The mitigation potential of investments in irrigation are mixed or difficult to anticipate as information on the energy sources used or replaced by their implementation is needed. Moving forward, the authors suggest incorporating mitigation objectives into project monitoring systems to enable more robust and transparent assessment of climate change mitigation. To avoid dramatically increasing monitoring burdens, project design teams could identify practices likely to have the largest impact on emissions or carbon sequestration during the design phase and then monitor the adoption of focus practices. IFAD is already moving in this direction; it is planning to incorporate the Ex-Ante Carbon-balance Tool (EX-ACT) in its project design and monitoring cycle. This study shows agricultural development is helping farmers with adaptation and contributing to climate change mitigation. Although IFAD investments were driven by adaptation, we are increasingly incorporating mitigation objectives and plan to scale it up in the future.